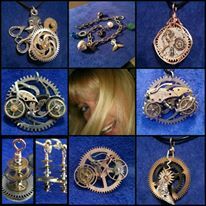 Phoenix Nest Boutique, Estes Park, Colorado – Chaordicwear – Up-cycled, One-of-a-kind, Handmade Jewelry you can Wear everyday! Making Order out of Chaos! Check out Phoenix Nest Boutique next time your in Estes Park Colorado. It’s in “The Old Church Shops” building. Jennifer, the owner and leather-smith is an amazing artist.